National Geographic gave us a dream assignment. Here’s how our urban design team tackled it. How would you design a “city of the future”? Susan Goldberg, the editor in chief of National Geographic magazine, posed this very question to me last year after we met at a sustainability conference in Hong Kong. The prompt was familiar, and yet intriguingly open-ended. Our team of urban designers at SOM is focused every day on the challenges that cities will face in the future — from population growth to climate change — but our work is typically driven by the constraints of a project brief. Rarely are we given free rein to imagine a city from scratch. The prospect of contributing our ideas to such an influential magazine was equally intriguing. 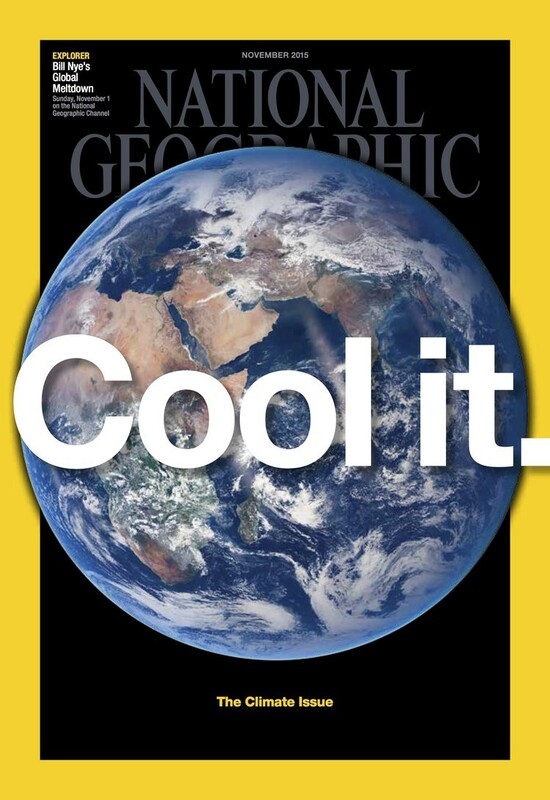 Like so many others, I grew up an avid reader of National Geographic. It provided a seemingly endless stream of fascinating places, people, history, and exploration, which I simply could not absorb enough of as a young person. Reading the magazine stoked my interest in the larger world, an awareness which is necessary to become a successful urban designer in this rapidly evolving and increasingly connected society. 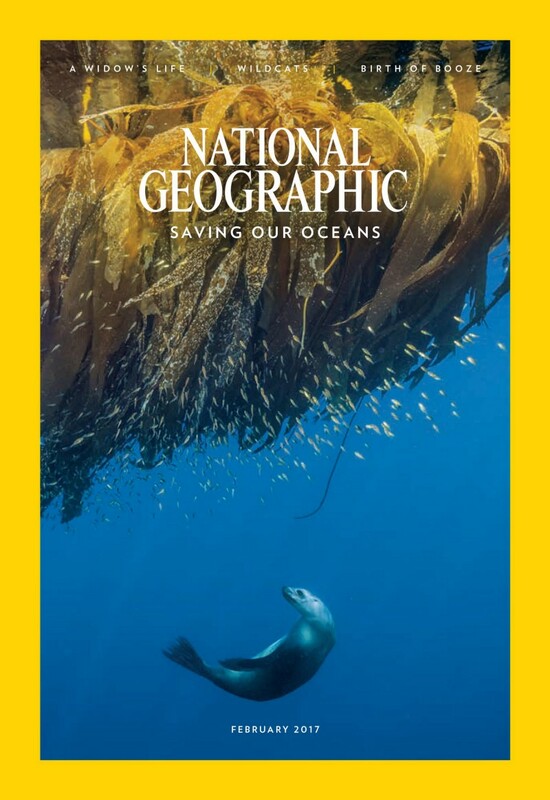 Under Ms. Goldberg’s leadership, National Geographic has been shifting its focus to address key issues that are fundamentally changing our world. These include pollution, waste, food scarcity, global warming, habitat loss, and many others — concerns that we as urban designers address in many of our projects. As population growth and urbanization threaten to alter our planet’s ability to sustain itself, the magazine’s editors decided to devote their entire April 2019 issue to cities and the future challenges they face. 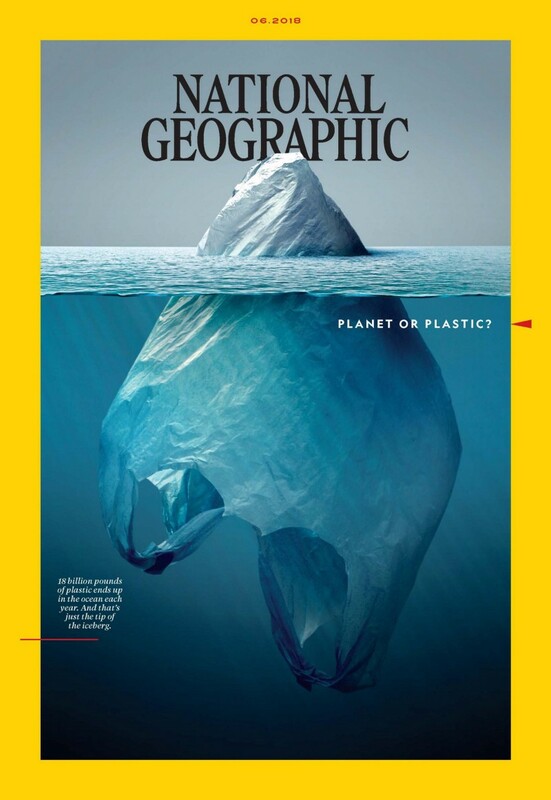 Recent covers of National Geographic show the magazine’s focus on issues affecting the health of our planet. For SOM, a global design practice working in eleven offices around the world, a project like the Future City allowed us to tap into the broad range of expertise within our firm — linking together multiple contributors and ideas around architecture, structures, urbanism, and ecology. We also saw it as an opportunity to visualize many of the concepts that our City Design Practice, a group dedicated to large-scale master-plan work, has been advancing. So we enthusiastically undertook the assignment — and quickly found that the initial question led to many more. In answering these questions, the design team was able to formulate the concepts that eventually made it into the pages of the magazine. How far in the future are we talking about? This was the first question that vexed the design team. We did not want it to be so far in the future that we would not be able to speculate about what may or may not happen to cities. We wanted to avoid Jetsons-like clichés such as flying cars and futuristic buildings disconnected from their surrounding urban context. Most importantly, we thought our Future City should be close enough in the future that most of the design team — and readers of the magazine — could actually see some of these concepts either come to fruition, or be modified to fit changing priorities. 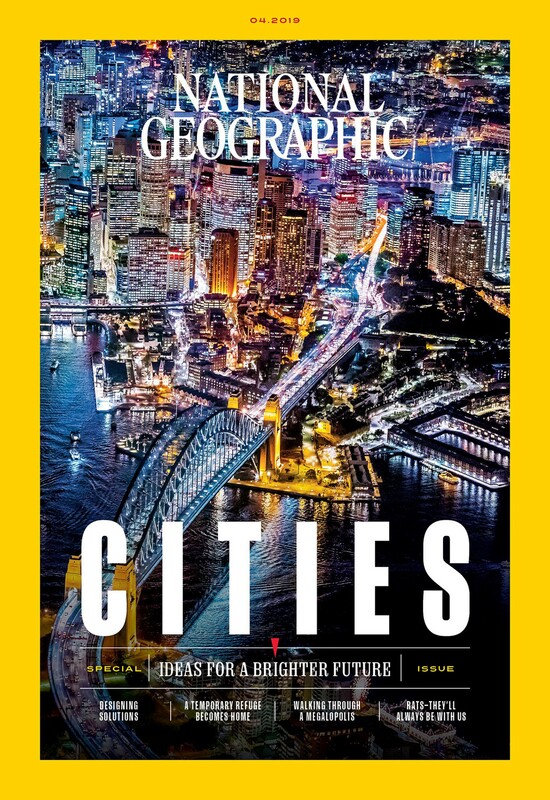 Working with National Geographic staff, we selected the year 2050: far enough in the future to make significant changes in how we think about and build cities, yet still close enough for many people to see change within their lifetimes. This is also the year when the United Nations estimates the global population will reach 9.8 billion people, with 70% of those living in cities. This combination of factors made 2050 an appropriate target date. 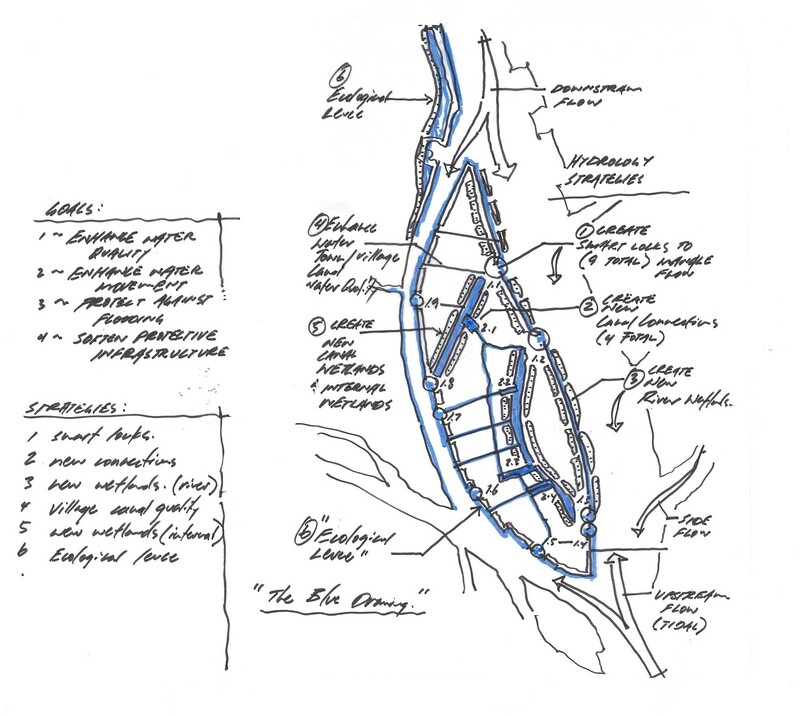 This led us to develop the idea of “biomorphic urbanism,” which places ecological systems and human-centered design as the most important drivers of city form. What are the key ideas behind the Future City’s design? We started by focusing on what we believe is the single most important issue for global urbanization — the need to stabilize and restore ecological systems. By taking a strong and proactive stance on this issue, we can address many related problems: clean water, carbon sequestration, human health, and habitat loss. This led us to develop the idea of “biomorphic urbanism,” which places ecological systems and human-centered design as the most important drivers of city form. Biomorphic urbanism can change the way we look at cities and also address the pressing needs of restoring global environmental health. It is a way of approaching the design of cities and buildings that lessens our impacts on the Earth and gives nature a chance to restore itself, so that it may sustain all of us. How did SOM develop the ideas and concepts for the Future City? 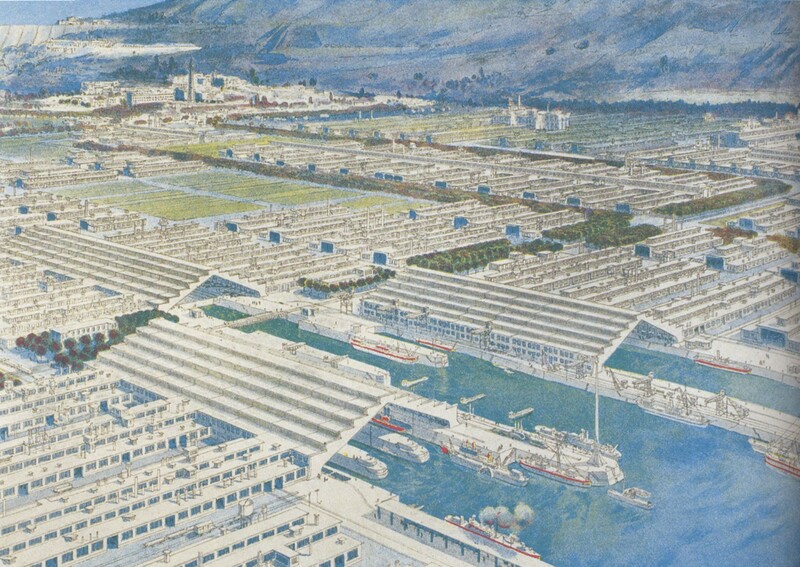 With the basic parameters set and our intentions focused on ecological and climate change issues, we turned our attention to influential “future city” concepts from the past. 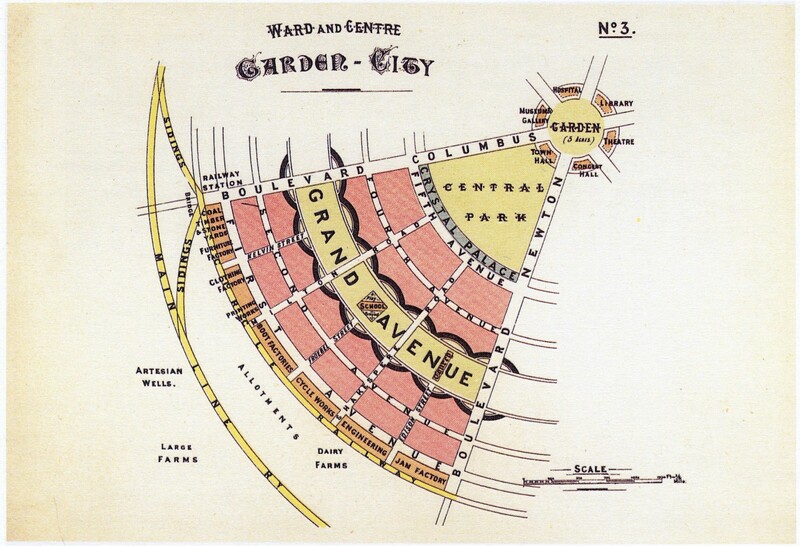 We looked at projects such as English planner Ebenezer Howard’s Garden Cities of To-morrow from 1902, which launched the garden city movement, and Tony Garnier’s Une Cité Industrielle from 1914, which proposed a vision for a utopian form of urban living. We then surveyed the innovative and progressive ideas being implemented in cities around the world today — in New York, Hong Kong, and Copenhagen, among many others — and speculated on how those concepts may advance by 2050. We brought experts within SOM, many with decades of experience, together with experienced personnel from National Geographic to develop the overarching concepts and themes. The larger team included urban planners, architects, landscape architects, structural engineers, interior designers, and cartographers. We also examined recent work by researchers in other fields like biology, sustainability, and human interactions, such as that of biologist and Harvard professor E.O Wilson. Where is this Future City located? The Future City is not tied to any specific place in the world — instead, it visualizes concepts that can be adapted and applied to existing cities everywhere. We debated whether to focus the project on an existing city, or a new speculative city created from scratch, and ultimately we felt that focusing on a single real-world city would raise additional questions. We did not want these questions to distract from the core ideas being proposed. 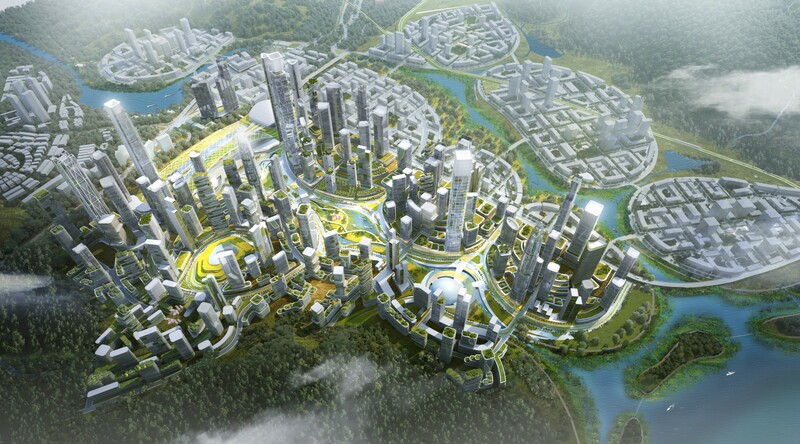 Even still, the design of the Future City and its regional context were inspired in part by real locations and actual projects on which SOM designers have worked. Given the likelihood of sea level rise, why is the Future City on the coastline? Today, approximately 40% of the world’s population lives within 100 km (60 miles) of an ocean. Many cities in the future may continue to be constructed close to oceans, and those that already exist will likely become even more dense. We felt strongly that we should not ignore this important fact of urbanization. The Future City proposes several ideas about how to mitigate sea-level rise: creating coastal setbacks, using wetlands and protective levees to buffer against storm surges, and designing artificial reefs to reduce erosive wave action. What’s an “urban hub,” and what role does it play in the future of urbanization? National Geographic suggested this term to describe the cluster of neighborhoods and districts that we used as the building blocks of the Future City. Typically, an urban designer might call this a “district” or “precinct.” But we liked the term “urban hub” and decided to incorporate it into the story. In our Future City concept, an urban hub is a cluster of eight to ten (or more) pedestrian-focused neighborhoods, bounded by major natural systems such as hydrological corridors, and connected by transit. These hubs can be high-density or low density, and can have any mix of land uses needed by the city: residential, manufacturing, or commercial. Crucially, by concentrating development within defined areas, this approach to city planning can help maintain a balance between urbanized areas and protected land. We propose that cities in the future should be composed of interconnected hubs, designed according to biomorphic principles. While urban hubs can be different sizes, a typical hub might be approximately 1,000 acres (400 hectares) in land area. Therefore, a city comprising ten urban hubs would be about 10,000 acres (by comparison, the island of Manhattan in New York City is 14,000 acres). This urbanized zone would be interwoven with ecological zones of approximately equal area to make the complete city. How can these concepts be applied to existing cities? Existing cities can adopt many of these ideas to begin rethinking infrastructure, development patterns, and transportation systems. This can allow these cities to face many of their most pressing issues — restoring ecosystems, achieving resiliency against natural hazards, and creating social mobility and economic equity for their citizens. We learned many things while designing these solutions for a future city. Our hope is that these concepts for an imaginary place can help city leaders around the world consider ways to counteract the potential issues they will face in an urbanizing world. Working with National Geographic led us to think about how we communicate the importance of this work. This collaborative effort reinforced our conviction that the only way to truly face the climate crisis is by welcoming contributions from all fields — and building on each other’s ideas to find and implement bold solutions. Approximately 20 design professionals from SOM and National Geographic contributed to this project. The lead designer for the project was Peter Kindel, a City Design Practice Director in SOM’s San Francisco office. The core design team included Michael Powell, James Kirkpatrick, Zi Yi Chen and Tanli Lu of SOM’s Hong Kong office, and Saki Mizuguchi and Nadia Conceicao in SOM’s San Francisco office. Jason Treat of National Geographic made significant contributions to the conceptual and graphic elements of the Future City. Beyond this core team, SOM personnel in London, New York, and Washington, D.C. all made small and large contributions through their research, conceptual input, or graphic representation techniques.